Gautam Deb was today named the Trinamul Darjeeling district chief (plains) seven months after he was removed from the post following reports of faction tussles in the party. "On the basis of consultations with our party supremo Mamata Banerjee and her assent, it has been decided that Gautam Deb will be the new district president of our party for the plains in the Darjeeling district," minister Aroop Biswas, who is Trinamul's observer for the district, said at Uttarkanya this afternoon. Deb, who was the Trinamul district president for over 11 years since July 2004, was removed from his post on November last year after the party failed to secure majority at the Siliguri Municipal Corporation and in the three-tier Mahakuma polls in the Siliguri subdivision, also held last year. 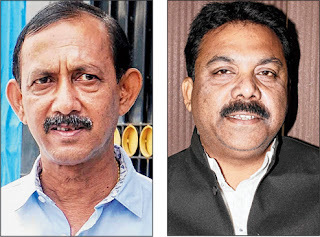 Ranjan Sarkar, a former district Trinamul Youth president, replaced Deb in November but the allegation of a faction-riven campaign reared its head again when Bhaichung Bhutia lost to Asok Bhattacharya in the Siliguri seat. Bhutia, while not taking names of any leaders, had said he had not got leads from civic segments in Siliguri that had Trinamul councillors. He had asked the party leadership if the Siliguri Model was the only factor to blame for his loss. Back in November last year, after back-to-back defeats, a section of Trinamul leaders had "met the state leadership and fumed against Deb. They questioned his competence and demanded that he be removed from the post. The state leadership, for some reason, bought into their theory and removed him, without realising that despite such failures he is the only leader who can bring workers and leaders of all lobbies together," a political observer said. Deb has been told to sit with other leaders of Siliguri and surrounding areas and form the district committee and send the names to the state leadership for approval, a party source said. Biswas, who is also the state PWD minister, when asked about the hill committee of Trinamul, said: "We have Rajen Mukhia in the hills (Mukhia is convener of Trinamul's hill committee). As of now, he will continue to be in the post. Also, Bikash Sarkar, the Darjeeling Trinamul Youth president, will be in his post." A political observer said: "During the Siliguri civic polls, these (Siliguri Trinamul) leaders worked against each other and the same thing was repeated in the Assembly polls. None of these leaders wholeheartedly worked for Bhaichung, which led to his defeat." The former footballer, disappointed with party leaders, collected poll data and shared it with the media which showed that Trinamul votes had come down in wards which had ruling party councillors, vis-à-vis the number of votes the party had secured in the civic polls last year. "It is surprising that when the party's vote share has increased in wards where there are councillors of the Left or the Congress, it has come down in wards where there are Trinamul councillors," Bhaichung had said. "I would urge the party to see why this so-called Siliguri Model is a success only in Siliguri and nowhere else and whether other than the Left and Congress, anybody else has any hand in this success," he said. Deb, who has 14 of the 47 wards of SMC under his constituency, managed to secure a lead of over 6,000 from these wards. "There is similar factionalism in Cooch Behar and in fact, it is more acute than in Siliguri. Even then, Rabindranath Ghosh managed to pull all the lobbies together and get eight of the nine seats for the party from the district," a party leader said. According to Trinamul leaders, the findings of Bhaichung and Deb's performance in his seat made it clear to the state leadership that only Deb could head the party in the Siliguri subdivision. "The roles of other leaders during the civic, rural and state polls were put under the scanner. It was found that they were busy handling their own differences or were aloof and inactive ahead of the elections. That the decision to pull out Gautam Deb from the civic polls was wrong has also been admitted by some state leaders. While the Left was openly projecting Asok Bhattacharya as the mayor, Trinamul, after Deb was asked not to contest, could not present any mayoral candidate," a party source said. "One of the principal reasons for Trinamul's good performance in north Bengal is the creation of the north Bengal development department and the consistent work of Deb as its minister in the past five years," the party source added.